As the summer comes to an end, so too does my son’s time with his summer teacher. She has been with him for the past 18 months… in our home and at school… supporting him as he learns to put all of his words and concepts together in his little head. How on earth does one say THANK YOU for that?! For the longest time, my son, with the help of his teacher, has been working on securing letter names, sounds and formations. My little man wanted to make his teacher a picture so this seemed like a good place to start and gave me the inspiration for a home made gift. Prior to starting, cover your canvas in a layer of white paint or preferred color. Let dry. 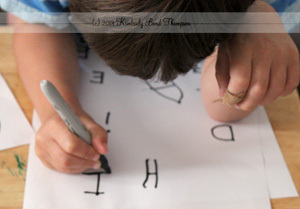 Begin by having the child write their letters or numbers or even draw shapes. Whatever they can do will be perfect! Seriously… don’t stress! Leave some space around the different elements on the paper. Tear each of the elements out of the paper, leaving rugged edges is fine. If you want to practice scissor skills, that would work too! 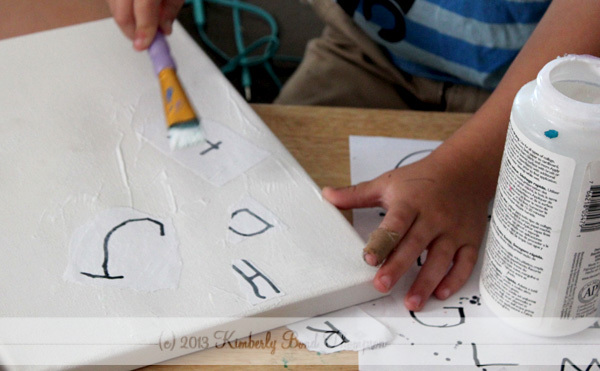 After they are torn apart, lay down a layer of mod podge or gel medium on your canvas. Arrange the different elements onto the canvas in a random pattern. Cover the elements with another layer of mod podge or gel medium to secure. If you used a water soluble marker, you may see some bleeding. No worries… that looks cool too. Allow to dry. Using the acrylic paint (you can water down the acrylic paint if it is too thick), cover the end or even the length of one of the pieces of string. Drag or drop onto the canvas for really cool and fun patterns! If holding the string by the finger tips is hard, wrap the length of the string around the width of the hand so the painted end hangs free to drag. 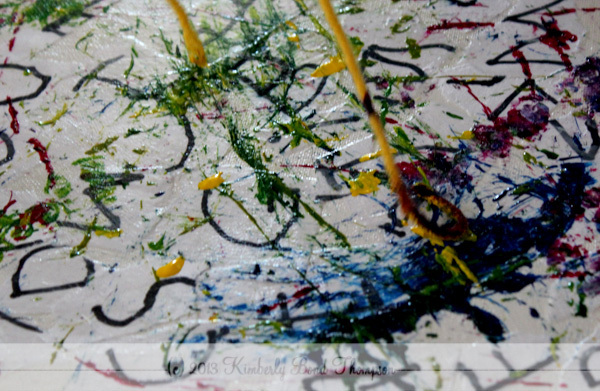 If you drop the string onto the canvas, ever so gently tap the string down so that the entire design hits the canvas. Try different textures and types of string for different effects. Using the paint brush or your finger, be sure to cover the sides of the canvas and drag the string along them as well for a finished look. 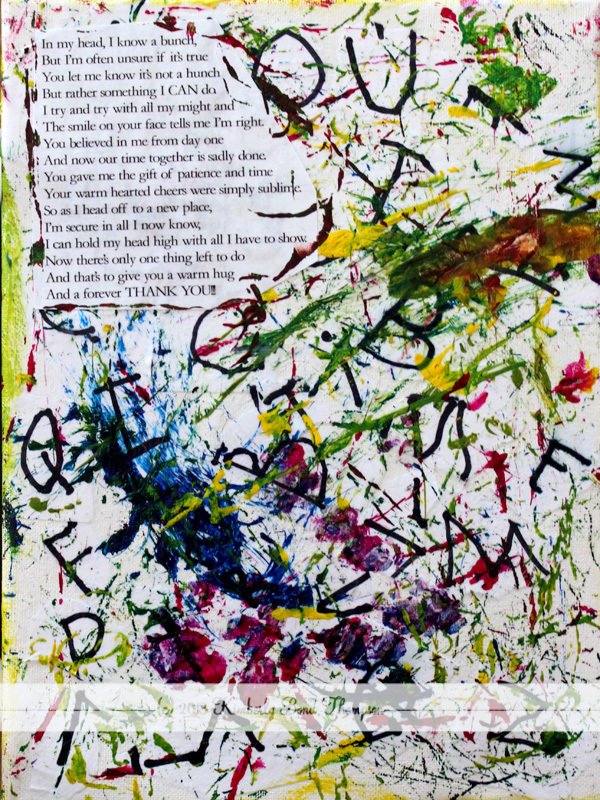 If you like, you can secure a poem or picture or special hand written note to the canvas with the modpodge or gel medium to finish it off. Be sure to place the medium both below and on top of the paper you secure. Voila! 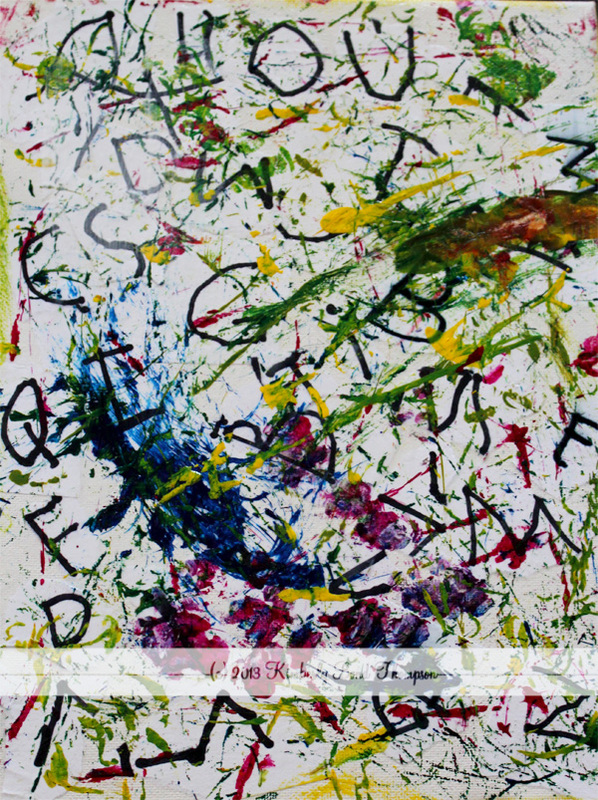 You have now created a unique piece of art to say thank you… and your teacher can see all of the hard work in its foundation. Up next, a list of great gifts for aides, therapists and para professionals! She did! People are always surprised when I say… yup, we made that lol. I will have to try this….thanks for sharing. You are very welcome! Would love to see what you come up with! It was so fun to try 🙂 thanks for taking the time to comment! I definitely will link back as soon as I complete it!